Air Explorer is an application that manages easily all your files in cloud servers (Google Drive, OneDrive, Dropbox, Mega, Box, Mediafire, WebDAV, Copy, Yandex,...) and FTP and SFTP services. It transfers files between the clouds, synchronizes folders between any cloud or your computer and, optionally can encrypt your files when you upload them to the cloud. Also, you can schedule your file transfers and synchronizations. Moreover, it supports multiple accounts from the same server and centralizes the search of your files across all the clouds. Air Explorer makes all your clouds work as one, allows drag'n drop files between your computer and the clouds and, copy/paste between cloud servers and pause and continue uploads and downloads. It doesn't lose the clouds features like thumbnail view of the pictures and sharing files. 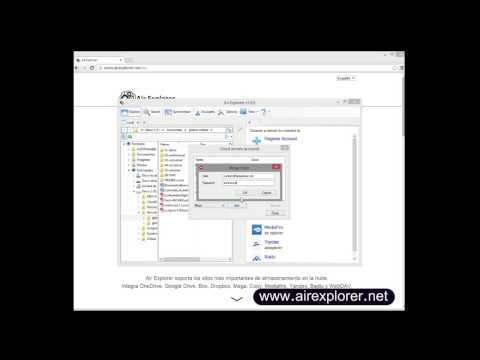 Air Explorer was added by AirExplorer in Oct 2014 and the latest update was made in Mar 2019. The list of alternatives was updated Apr 2019 There is a history of all activites on Air Explorer in our Activity Log. It's possible to update the information on Air Explorer or report it as discontinued, duplicated or spam. rsync for cloud storage. Rclone is a command line program to sync files and directories to and from the cloud. Mount NAS, Router, Google Drive, OneDrive and Dropbox to a network drive on File Explorer. No need for synchronization and no need for web browsers!. Otixo connects your favorite services (like Dropbox, Box, Google Docs, MobileMe, FTP, etc.) so that you can access all your online files in once place. GUI client for Google Drive based on the Electron . Discontinued Site is basically non-accessible. Alternatives to Air Explorer for Windows, Web, Mac, Linux, iPhone and more. Filter by license to discover only free or Open Source alternatives. This list contains a total of 25+ apps similar to Air Explorer. Maybe you want to be the first to submit a comment about Air Explorer? Just click the button up to your right!